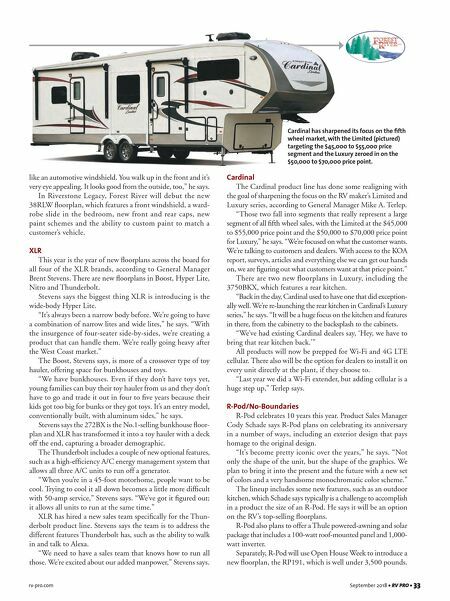 rv-pro.com September 2018 • RV PRO • 33 like an automotive windshield. You walk up in the front and it's very eye appealing. It looks good from the outside, too," he says. In Riverstone Legacy, Forest River will debut the new 38RLW floorplan, which features a front windshield, a ward- robe slide in the bedroom, new front and rear caps, new paint schemes and the ability to custom paint to match a customer's vehicle. XLR This year is the year of new floorplans across the board for all four of the XLR brands, according to General Manager Brent Stevens. There are new floorplans in Boost, Hyper Lite, Nitro and Thunderbolt. Stevens says the biggest thing XLR is introducing is the wide-body Hyper Lite. "It's always been a narrow body before. We're going to have a combination of narrow lites and wide lites," he says. "With the insurgence of four-seater side-by-sides, we're creating a product that can handle them. We're really going heavy after the West Coast market." The Boost, Stevens says, is more of a crossover type of toy hauler, offering space for bunkhouses and toys. "We have bunkhouses. Even if they don't have toys yet, young families can buy their toy hauler from us and they don't have to go and trade it out in four to five years because their kids got too big for bunks or they got toys. It's an entry model, conventionally built, with aluminum sides," he says. Stevens says the 272BX is the No.1-selling bunkhouse floor- plan and XLR has transformed it into a toy hauler with a deck off the end, capturing a broader demographic. The Thunderbolt includes a couple of new optional features, such as a high-efficiency A/C energy management system that allows all three A/C units to run off a generator. "When you're in a 45-foot motorhome, people want to be cool. Trying to cool it all down becomes a little more difficult with 50-amp service," Stevens says. "We've got it figured out; it allows all units to run at the same time." XLR has hired a new sales team specifically for the Thun- derbolt product line. Stevens says the team is to address the different features Thunderbolt has, such as the ability to walk in and talk to Alexa. "We need to have a sales team that knows how to run all those. We're excited about our added manpower," Stevens says. Cardinal The Cardinal product line has done some realigning with the goal of sharpening the focus on the RV maker's Limited and Luxury series, according to General Manager Mike A. Terlep. "Those two fall into segments that really represent a large segment of all fifth wheel sales, with the Limited at the $45,000 to $55,000 price point and the $50,000 to $70,000 price point for Luxury," he says. "We're focused on what the customer wants. We're talking to customers and dealers. With access to the KOA report, surveys, articles and everything else we can get our hands on, we are figuring out what customers want at that price point." There are two new floorplans in Luxury, including the 3750BKX, which features a rear kitchen. "Back in the day, Cardinal used to have one that did exception- ally well. We're re-launching the rear kitchen in Cardinal's Luxury series," he says. "It will be a huge focus on the kitchen and features in there, from the cabinetry to the backsplash to the cabinets. "We've had existing Cardinal dealers say, 'Hey, we have to bring that rear kitchen back.'" All products will now be prepped for Wi-Fi and 4G LTE cellular. There also will be the option for dealers to install it on every unit directly at the plant, if they choose to. "Last year we did a Wi-Fi extender, but adding cellular is a huge step up," Terlep says. R-Pod/No-Boundaries R-Pod celebrates 10 years this year. Product Sales Manager Cody Schade says R-Pod plans on celebrating its anniversary in a number of ways, including an exterior design that pays homage to the original design. "It's become pretty iconic over the years," he says. "Not only the shape of the unit, but the shape of the graphics. We plan to bring it into the present and the future with a new set of colors and a very handsome monochromatic color scheme." The lineup includes some new features, such as an outdoor kitchen, which Schade says typically is a challenge to accomplish in a product the size of an R-Pod. 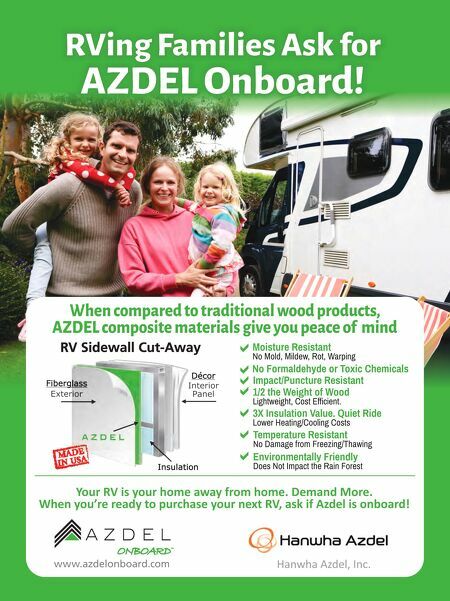 He says it will be an option on the RV's top-selling floorplans. R-Pod also plans to offer a Thule powered-awning and solar package that includes a 100-watt roof-mounted panel and 1,000- watt inverter. Separately, R-Pod will use Open House Week to introduce a new floorplan, the RP191, which is well under 3,500 pounds. Cardinal has sharpened its focus on the fifth wheel market, with the Limited (pictured) targeting the $45,000 to $55,000 price segment and the Luxury zeroed in on the $50,000 to $70,000 price point.